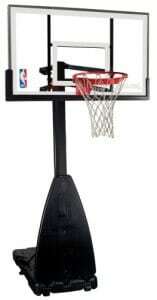 As basketball has become more popular many families have decided to invest in a basketball hoop for the home. In the past most of these hoops were in ground or wall-mounted systems that were very stable and effective but not really portable. More recently portable basketball systems have hit the market and revolutionized the at home basketball unit. 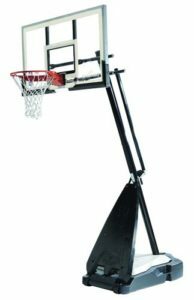 Now you are able to move your basketball hoop easily when your family moves, or when you find a better place to play basketball. 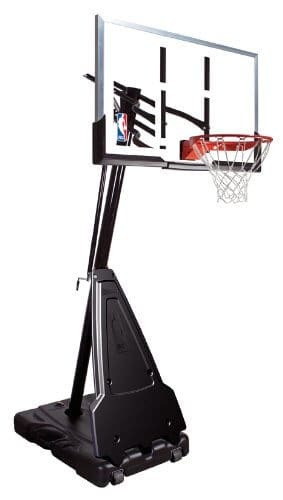 What we have decided to do to make finding the best portable basketball system easier is to list a large number of portable basketball hoops that range in price and features so that you are able to select the best portable basketball system for your home and wallet. 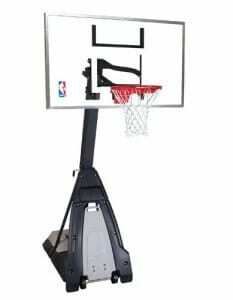 The Spalding Beast Portable Basketball Hoop is the best portable system according to us here at BestBasketballhoops.org. 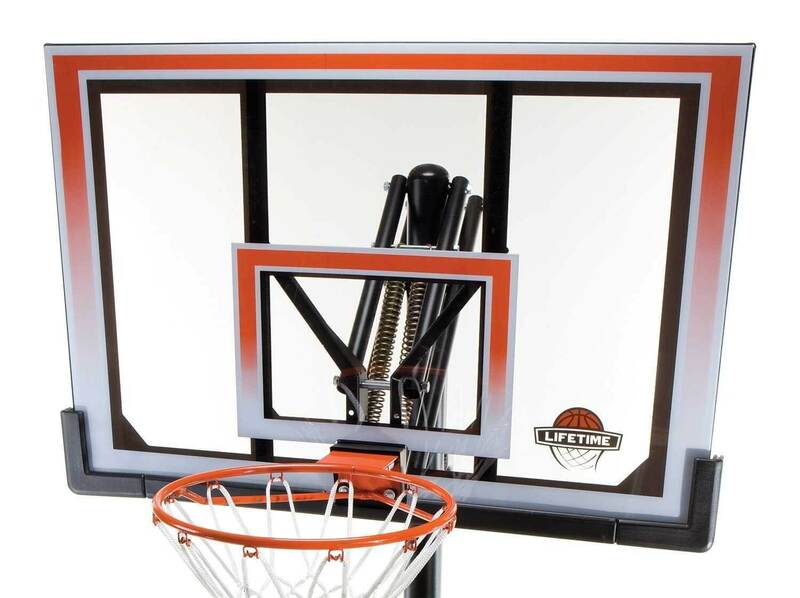 This hoop is a massive system and is the closest you can get to an arena quality hoop in a portable basketball hoop. While expensive, the features and quality components of the Beast make it worth every penny. You won’t find a more innovative portable basketball system than the Silverback NXT. Not only does the Infinity Backboard look sleek but it also uses a technique called flanging to make it stronger than other acrylic backboards. 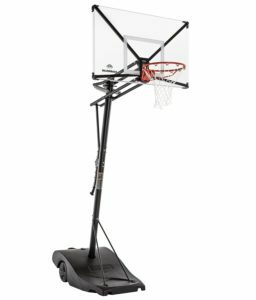 When you consider the ErgoMove and the unique design components that enhance stability found on the Silverback NXT, it adds up to one of the most unique portable hoops on the market. Spalding has improved there portable basketball systems through their Spalding Hybrid Portable Basketball System. With this portable basketball hoop the fill base is a hybrid setup that is filled with up to 200 pounds of sand and up to 19 gallons of water offering maximum stability. The Spalding Hybrid Portable Basketball Hoop also gets high marks for the quality of the backboard and rim, which offer high quality performance. Reviews from buyers of this hoop have been overwhelmingly positive. A solid middle priced portable basketball hoop great for families with players who are serious about the game. The 40 gallon fill base is large enough to make this hoop feel sturdy and minimize any chance of tipping. The height adjustment and backboard support are strengths for the Spalding 60 Inch Portable Basketball Hoop. For us, the only thing holding this hoop back is the fact that we feel the Spalding Hybrid is a superior hoop for a similar price. 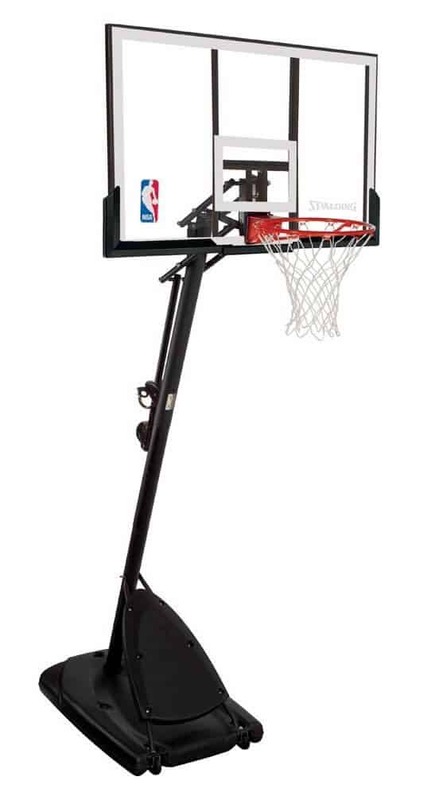 Rounding out our top five portable basketball hoops list is the Lifetime 51544 Portable Basketball System. This is the best low-cost (<$200) portable hoop that money can buy. At this price the Lifetime 51544 has a lot of quality features. The 34 gallon base is larger than almost any other portable basketball system at this price point. We also like that there is padding on both the bottom of the backboard and the support pole. The backboard is not great, but this should be expected for a low cost hoop. The Spalding Pro Slam has been around for several years and is the best low priced portable Spalding hoop. 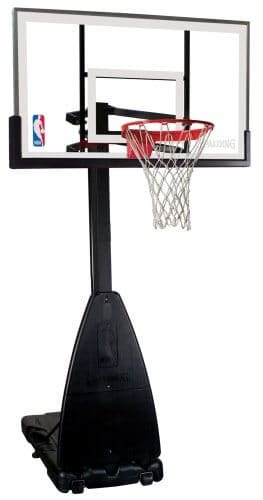 There are not many basketball hoops at the Pro Slam’s price point that come with an acrylic backboard rather than an inferior polycarbonate material. First Team specializes in top of the line portable basketball systems. These hoops really do offer arena style quality components and performance. On the downside you will pay for this performance as First Team hoops are quite expensive. 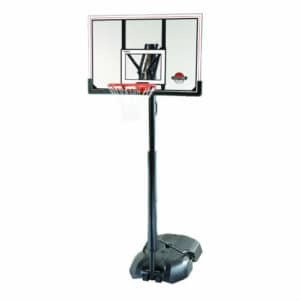 This Spalding basketball system has a more upright profile compared to other portable systems. This combined with the heavier tempered glass backboard gives us some concern about the potential for tipping during dunking and in high wind environments. 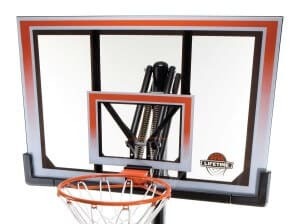 Otherwise, we love that this hoop has a tempered glass backboard as they perform significantly better than acrylic and polycarbonate alternatives. Since these portable systems have been put out into the market they have become better and more stable. Older and cheaper units tend to have more instability in their backboards and foundation. They also tend to wear out faster. However, most modern high quality portable basketball systems have professional level materials and can support just about any type of abuse one can muster. Because of this we think it is important to select your portable basketball system wisely with both price and quality in mind. The cheaper units that we list will meet the needs of most recreational players. They will often have a spring rim with a shatterproof backboard. However, if you are looking for a type of hoop for the true baller, then the more expensive options may be appropriate. 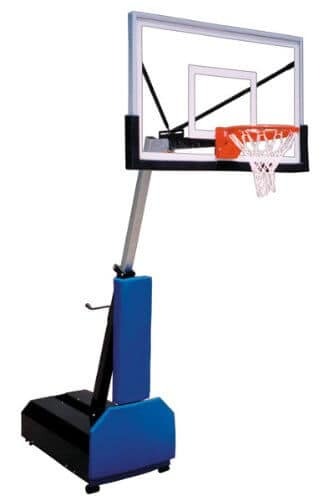 These high end portable units feature professional grade breakaway rims with glass backboards that can take the most severe punishment. To become a skilled basketball player it is critical to grow up playing the game. Having the best portable basketball system ensures that you have a place to play anytime, any day. While in ground systems are the most stable, when it comes to versatility, portable basketball hoops are the absolute best option.